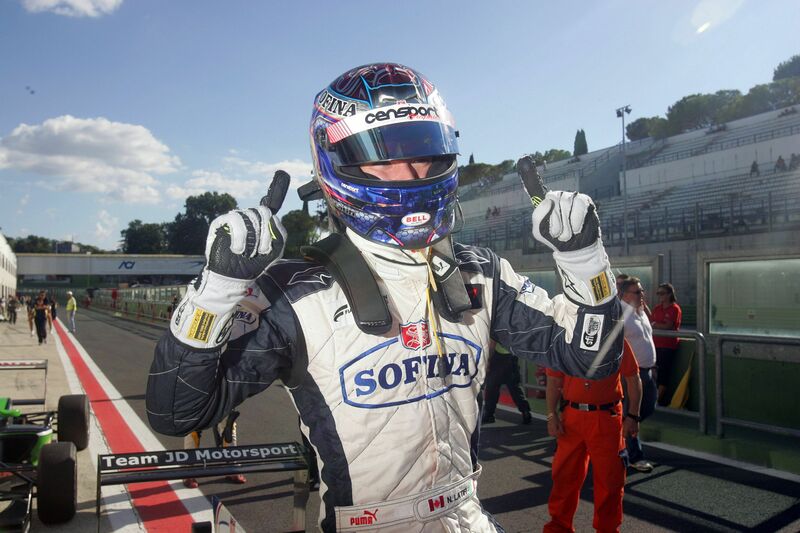 16/09/2012 - Nicholas Latifi has been the protagonist of the sprint race run on 15’ plus a lap. The Italo-Canadian of JD Motorsport managed to pull away after starting from the pole position but the action is all behind him: at turn one Kevin Giovesi, Eddie Cheever, Henrique Martins and Brandon Maisano crash. The French driver of Prema and the Milanese winner of race two went out of the games straight away, while Martins managed to make it to the pits but is forced to the retirement. The only one that kept on going was Eddie Cheever that was at the back of the bunch behind the safety car. On top of the group, behind Nicholas Latifi was Riccardo Agostini, his team mate at JD Motorsport, while the third position was occupied by Mario Marasca. At the re-start after the safety car, there are no position changes but a tight battle is fought by Michael Heche (BVM), Robert Visoiu (Ghinzani) and Sergey Sirotkin (Euronova). At the end the Swiss at his first experience in the championship managed to get the fourth position and to keep at his back Yoshitaka Kuroda and Robert Visoiu. At the back of the group, Sergey Sirotkin (Euronova) had to give his position away to Eddie Cheever after his engine failed him. The driver from Moscow managed to keep on going but left oil on the line which risked to ruin the day to Nicolas Latifi. The Canadian went wide in fact at the hairpin of the last lap on the slippery tarmac due to the oil and Agostini just managed to avoid the contact with his team mate; the two did well avoiding contact and managed to cross the finish line in first and second position.